The Danish Palestinian Friendship Association said Monday it would expand its anti-settlement advertising campaign after Copenhagen bus operator Movia said it was dropping their ads from buses in the city. 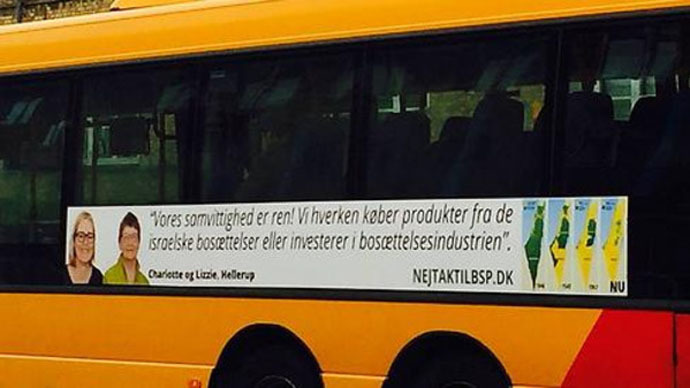 The advertisements were put on 35 buses in the Danish capital and featured two women and the quote: “Our conscience is clean! We neither buy products from the Israeli settlements nor invest in the settlement industry." But Movia said they dropped them after four days because of the number of inquiries they received about what the Danish Palestinian Friendship Association stands for, AFP reports. [We] "received a significant number of inquiries regarding the Danish Palestinian Friendship Association's campaign against Israeli settlements." Fathi El-Abed, the Chairman of the Danish Palestinian Friendship Association, however said that the ads were harmless. “It’s a clear attempt to deny us our freedom of speech. There is nothing whatsoever about this campaign that is harmful, discriminatory or hateful in any way,” he told AFP. Posted by Nej Tak til BSP on 30 Апрель 2015 г. He insisted that his organization would press on with a national advertising campaign on Israeli settlements. The decision by Movia is in stark contrast to their refusal last year to drop ads featuring bare breasts by a plastic surgery clinic after complaints by feminists. In New York an arguably far more offensive ad campaign was allowed on buses after a judge overturned a ban in April from the Metropolitan Transportation Authority (MTA). The adverts were a spoof of an earlier far less offensive campaign by the Council on American-Islamic Relations, which encouraged Twitter users to post messages with the hashtag MyJihad where they would right about their personal and peaceful achievements. There were also ads showing a 1941 photo of a Muslim leader meeting Hitler, which appeared on buses in Philadelphia, which were also organized by the American Freedom Defense Initiative (AFDI), a pro-Israel group led by blogger Pamela Geller. AFDI was also behind the contest in Texas on Sunday to award $10,000 for the best cartoon depiction of Muhammad, which ISIS attempted to attack. The latest ads come after ads linking “Islamic Jew-hatred” with Adolf Hitler appeared in San Francisco In January and in Washington DC last year. The campaign to boycott Israeli produce and companies operating in the areas of the West Bank, which have been occupied by Israeli settlers, began in 2005, although its effectiveness in stopping the settlement program and its impact on the Israeli economy has been questioned. The issue of Israeli settlement building in the West Bank is one of the main stalling factors in the now dead Palestine-Israeli peace talks. In an interview Sunday with the Financial Times and the Frankfurter Allgemeine Zeitung, Jimmy Carter, former American President and peace activist, said the peace process was dead because Israeli Prime Minister Benjamin Netanyahu would never accept a Palestinian state.